- Minimum 2 méterre kell lennie a vezérlőnek a vevő antennától, a védő távolságon belül számítógép sem lehet. - Elektromos kábeleknek a lehető legmesszebb kell lenni. - Lehetőleg tisztán kell tartani. A portól, nedvességtől az elektronikát óvni kell. - Nagy méretű fém tárgyakat az antennák elektromágneses mezőjében mozgatnak. - Elektromágneses antennákból 7 antenna telepíthető egymás mellé (4 adó, 3 vevő), ezt követően 2,5 - 3 m. szünet, majd jöhetnek az újabb antennák. Rádiófrekvenciás ás akuszto magnetikus rendszereknél több antennát lehet telepíteni. - Szétvagdosott, összegyűrt, vagy az antenna érzékenységének nem megfelelő méretű és/vagy típusú áruvédelmi címkénél. These tags are essentially an LC tank circuit that has a resonance peak anywhere from 1.75 MHz to 9.5 MHz. The most popular frequency is 8.2 MHz. Sensing is achieved by sweeping around the resonant frequency and detecting the dip. Deactivation for 8.2 MHz label tags is achieved by detuning the circuit by partially destroying the capacitor. This is done by submitting the tag to a strong electromagnetic field at the resonant frequency which will induce voltages exceeding the capacitor's breakdown voltage, which is artificially reduced by puncturing the tags. In some older systems electronic devices have been known to set off alarms. RF systems can react even to a coil of wires (for example, aCat5 cable carried by a forgetful network technician) because stray capacitance forms a LC circuit within the coil itself. It is also possible for alarms to go off without anyone crossing the gates. Such interference is often due to other nearby alarm systems. Radio Frequency (RF) Systems are the most widely used systems in the United States today and RF tags and labels are getting smaller all the time. As you can see in the drawing at the right, the RF EAS system works like this: A label -- basically a miniature, disposable electronic circuit and antenna -- attached to a product responds to a specific frequency emitted by a transmitter antenna (usually one pedestal of the entry/exit gate). The response from the label is then picked up by an adjacent receiver antenna (the other pedestal). This processes the label response signal and will trigger an alarm when it matches specific criteria. The distance between the two gates, or pedestals, can be up to 80 inches wide. Operating frequencies for RF systems generally range from 2 to 10 MHz (millions of cycles per second); this has become standard in many countries. 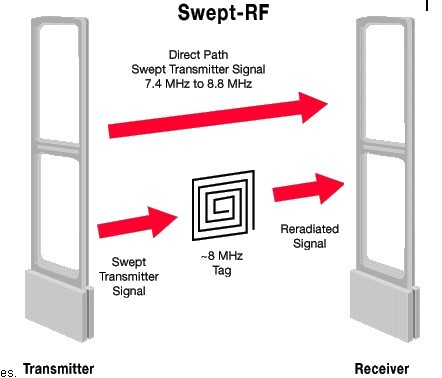 Most of the time, RF systems use a frequency sweep technique in order to deal with different label frequencies. Sometimes both the transmitter and receiver are combined in one antenna frame -- these are called mono systems and they can apply pulse or continuous sweep techniques or a combination of both. According to Tag Point Ltd. experts, mono systems could be effective for you if your store's entry is small. The mono system is used with hard labels, which are slightly more expensive than paper labels used with RF sweep techniques. There are many different ways to implement an RF system. The basic idea is that the tag has a helical antenna etched from thin aluminum bonded to a piece of paper. At the end of the antenna is a small diode or RC network that causes the tag to emit a radio signal in response to the radio signal it receives. To disarm the tag, a strong RF pulse (much stronger than the gates emit) blasts the tag and burns out the diode or RC components. Between the gates a burned out tag does not emit a signal, so the gates let it pass without an alarm. What most people refer to as an electromagnetic tag is actually a metal wire or ribbon that has high permeability, making it easy for magnetic signals to flow through it, according to Sensormatic's EAS Product Co. CTO Hap Patterson. "When we drive the tag, flux is being allowed to flow through the tag until it's saturated," he says. "When it's saturated, from a magnetic perspective, it begins to look like air. Saturation occurs abruptly and is an important part of the design of the tag." A magnetized piece of semi-hard magnetic material (basically, a weak magnet) is put up next to the active material to deactivate it. When you magnetize the semi-hard material, it saturates the tag and puts it in its inactive saturated state. That same kind of tag is often used in the library, where it can be reactivated by demagnetizing the semi-hard magnetic material. The EM system works by applying intensive low frequency magnetic fields generated by the transmitter antenna. When the strip passes through the gate, it will transmit a unique frequency pattern. This pattern is, in turn, being picked up by an adjacent receiver antenna. The small signal is processed and will trigger the alarm when the specific pattern is recognized. Because of the weak response of the strip and the low frequency (typically between 70 Hz and 1 kHz) and intensive field required by the EM system, EM antennas are larger than those used by most other EAS systems, and the maximum distance between entry pedestals is 40 inches. Also, because of the low frequency here, the strips can be directly attached to metal surfaces. That's why EM systems are popular with hardware, book and record stores. The newer acousto-magnetic system, which has the ability to protect wide exits and allows for high-speed label application, uses a transmitter to create a surveillance area where tags and labels are detected. The transmitter sends a radio frequency signal (of about 58 kHz) in pulses, which energize a tag in the surveillance zone. When the pulse ends, the tag responds, emitting a single frequency signal like a tuning fork. While the transmitter is off between pulses, the tag signal is detected by a receiver. A microcomputer checks the tag signal detected by the receiver to ensure it is at the right frequency, is time-synchronized to the transmitter, at the proper level and at the correct repetition rate. If all these criteria are met, the alarm occurs. AM material is highly magnetostrictive, which means that when you put the tag material in a magnetic field, it physically shrinks. The higher the magnetic field strength the smaller the metal becomes. The metal actually shrinks about one-thousandth of an inch over its full 1.50 inch length. As a result of driving the tag with a magnetic field, the tag is physically getting smaller and larger. So if it is driven at a mechanically resonant frequency, it works like a tuning fork, absorbing energy and beginning to ring. This tag also requires bias magnet material in addition to active element material. The active material will shrink no matter which direction the magnetic field is placed upon it. If the tag is driven with Frequency, F, it gets smaller as the magnetic field increases and larger as it's driven towards zero. This means that while it is being driven at F, the tag is trying to work at 2F, because at both positive and negative halves of the drive signal, the tag is getting smaller. To get the tag to work at F, a bias field is required. The bias is provided by a semi-hard magnetic element in the label. When magnetized, the bias prevents the active element from ever being in a zero field condition. So for an entire half of the drive signal, the tag shrinks. Then it expands for the other half. This results in an F response. When you walk through the gate with a tag, the transmitter in the gate energizes the material and causes it to resonate at F. The transmitter then stops. The tag will continue to "ring" at F for a short period of time, and the receiver listens for that frequency. If it hears it, it knows there is a tag and sounds the alarm. allowing correct operation of the system. similarly to securities, form circumference resonate at frequency close to 8.2MHz. ● Securities located to close to the system. current inducted in them by electromagnetic field generated by the transmitter. ● Metal elements that are rubbed against each other. ● Electric and electronic devices that operate close to the system. to be removed changing modulating frequency in the transmitter. their impact on the system.